This surname is English in origin. They had several children: Daniel (1799-1864), Michael (1801-1882), Barnabas (1804-1869), Mary Ann (1807-1891), James (1809-1877), Catherine (1811-1880), Nancy (1813 - 1835), William (-1877), John, Jane, and Elizabeth. Daniel, their oldest son, had been born in Pennsylvania in 1799. In 1823, the same year that his father died, Daniel married Elizabeth Strong in Ohio. Their family grew quickly. Daughter, Lydia was born in 1824, Israel was born in 1829, Elisha was born in 1831, Harrison was born in 1836, and Daniel was born in 1839. In 1849, Elizabeth died. After her death Daniel re-married. Hester Drain became the next Mrs. Daniel Daugherty. Michael married Lucinda McReynolds (1802-1861) and they lived for a time in Clark County, Ohio. The family had four children: Amos (1830-1861), Sarah (1833-1892), John (1835-1899), and Nancy (1841-1901). William married Mary VanDolah (1804-1867) and the family lived in Jasper County, Indiana. They had the following children: Mary (1828-1852), Jane (1839-1920), Samuel (1844-1912), Elizabeth (1848-1850), and Cynthia (-1888). Mary Ann married Albert Lanson (Alanson) White (1801-1844). The couple had the following children: Hannah (1826-1884), Michael Daugherty (1827-1917), James Lanson (1838-1907), John William (1838-1902), and Albert Samuel (1841-1917). Mary Ann died in 1891 when she was 84 years old. As described in "A Splendid Pioneer," Mary Ann moved with her family to Clark County, Ohio when she was eight years old. In 1825, she married Lanson White, the son of Nathaniel White. She was not yet an adult when she married, and her mother Nancy had to approve the marriage. However, the marriage license was never returned for filing. Together, Mary Ann and Lanson had eight children in Tippecanoe County, Indiana. They had gone with Nathaniel White and other settlers. In 1844, Lanson died. Mary, left with six of the eight children (two had died in infancy), attempted to farm and rear her family. She married Robert Williams, a farmer in Marion Twp., Jasper, Indiana. Catherine married Israel McLean (1804-1893) on Christmas Eve, 1829. He had been born in New York state. They had three sons: William (1834-1908), James (1838-1903), and Michael (1843-1880). Census records show the family living in Ohio and tax records show they moved to Iowa. 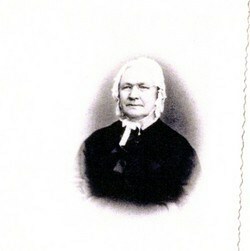 Nancy married Wiliam Bechtell (1808-1851). Fig. 2 - "Mary Ann Daugherty White" - photo contributed to findagrave.com by Joyce Daugherty Johnson. General Biographical information contributed by Heather Wylie. 1. Record of Wills, 1819-1902; Probate Place: Clark, Ohio. Ancestry.com, Provo, UT, USA. 2. Summary by Denali or Grant Porter. Ancestry.com. 3. "A Splendid Pioneer" originally shared by denaliporter80 to Groth Porter Family Tree, "The Story of a Very Strong Woman."